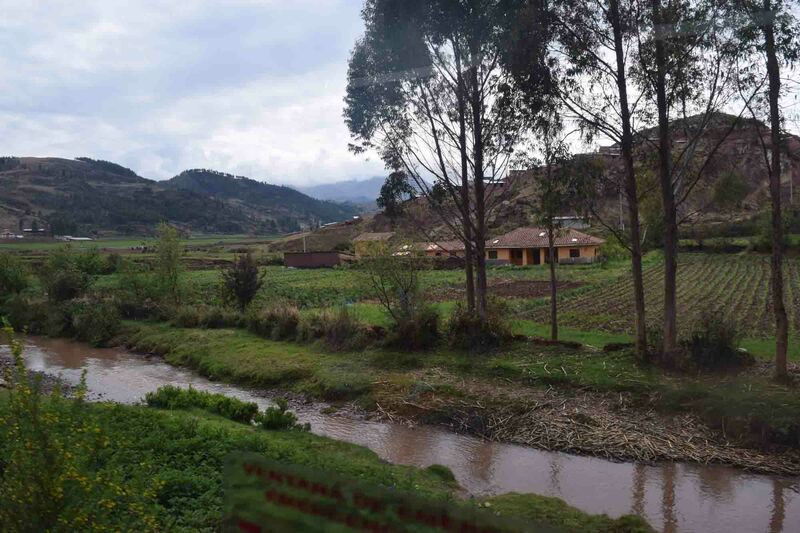 There are a few ways to get from Cusco to Machu Picchu. 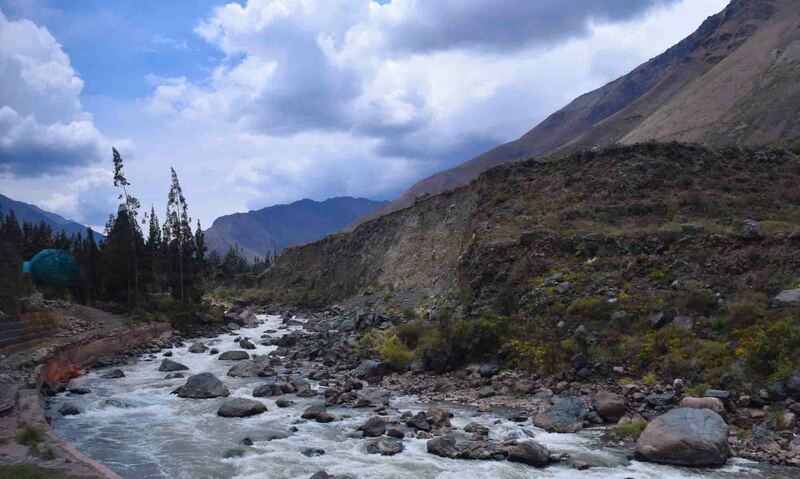 If you’ve a mind to it, many like to brave the trek over the mountains, the Inca Trail – there are several versions of it. There is apparently some back way in via road but you have to go a long way out of your way and very few people do it. Then you have the train. 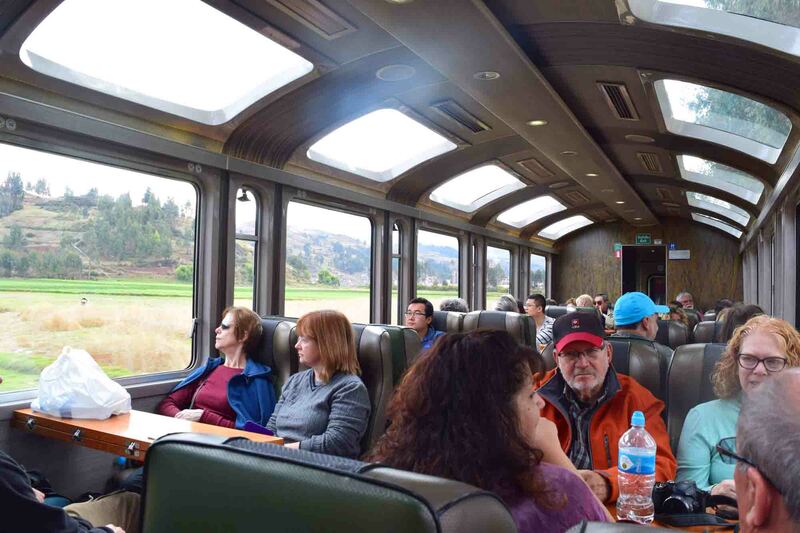 The train was my preferred option – I’m not sure how many options there were, but I went with PeruRail and I booked it online before I even left Australia. 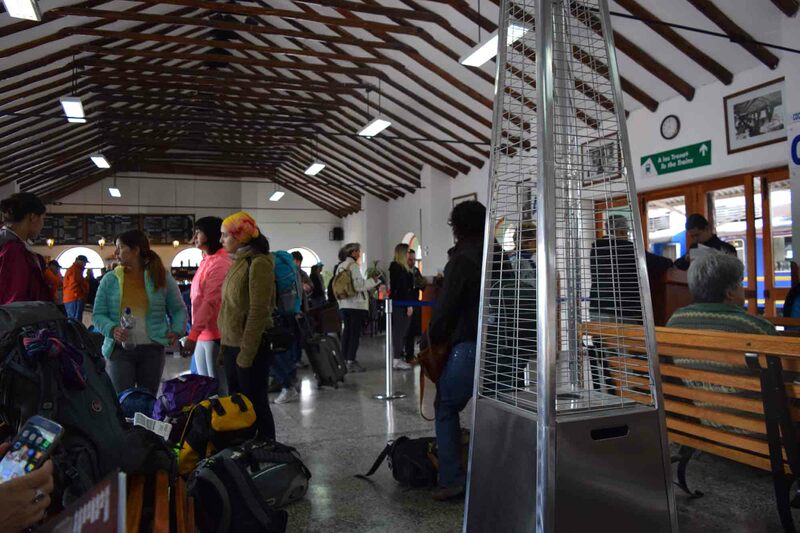 When I was in Lima I went to a PeruRail office and actually pick the ticket up. Which wasn’t too hard really. Cost wise, well, the prices depending on your class and which train you took. But from memory all the tickets were at least $80US and up. My ticket there cost $94US and the return was $99 and they were both in the special carriage called the ‘Vistadome’. There is a super deluxe option which is a different train I think which costs way more, this is according to Seat 61 the mid-range option though. The Vistadome was a carriage with extra windows in the roof. To be honest, I don’t think it’s all that special. The train is certainly comfortable, and the crowd was, on the whole, not backpackers but older tourists, mostly from the States. Poroy is not actually in Cusco. 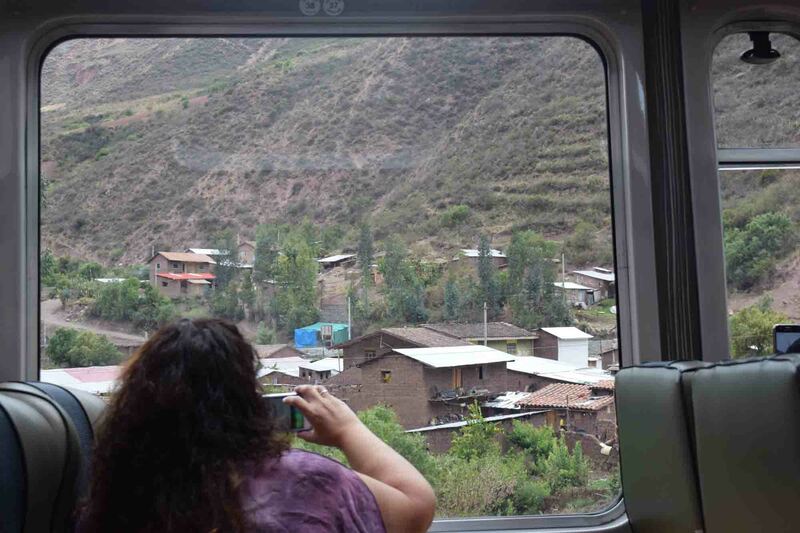 I suspect they leave from Poroy (there other trains that leave even further away from Cusco in Ollantaytambo which is actually in the Sacred Valley itself) rather than Cusco because of cost. 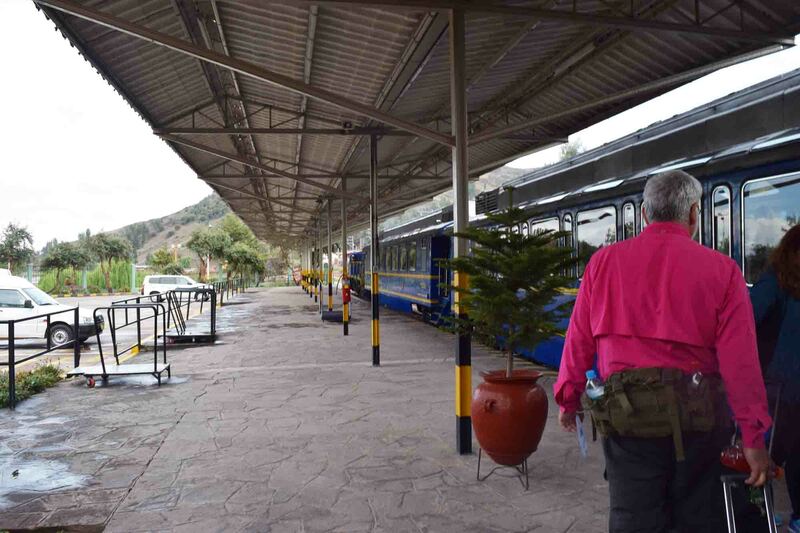 There is a track from Cusco but I’m not sure it was the same gauge for starters, and it probably costs less to use the station at Poroy which is mostly just used for Peru Rail. So, taxi took 20-30 minutes and cost 25 soles from Cusco to the station in Poroy. On the return I ran for a taxi and got one of the first few to leave as I had been told there often aren’t enough cabs for all the passengers. At Poroy station just about to board. The station was quite nice and everyone waited inside. There was a little café and heaters if it should get too cold, and the place was packed with tourists ready to journey to Machu Picchu. The train pulled out a few minutes late, but we were on our way. We had tables and decent legroom, and it wasn’t too hard to fall asleep on the train as I did on the return leg. The trip took the best part of 4 hours. The in-carriage experience was comfy, there were snacks on offer, and a running commentary on the way up which was, well, informative at times but generally annoying more than anything. On the way back there was a bit of a fashion show in the carriage (yes, you read right!) which naturally was just about trying to sell garments to the tourists at inflated prices. There were a few other things for sale too. View not far out of Poroy. There were only one or two stops on the journey, some trekkers were dropped off at one point, but generally it feels like a pretty exclusive experience. The scenery was the main reason for the Vistadome, and it was really interesting too. Basically it goes from a very dry area, through farmland, into rocky mountains with very little vegetation. 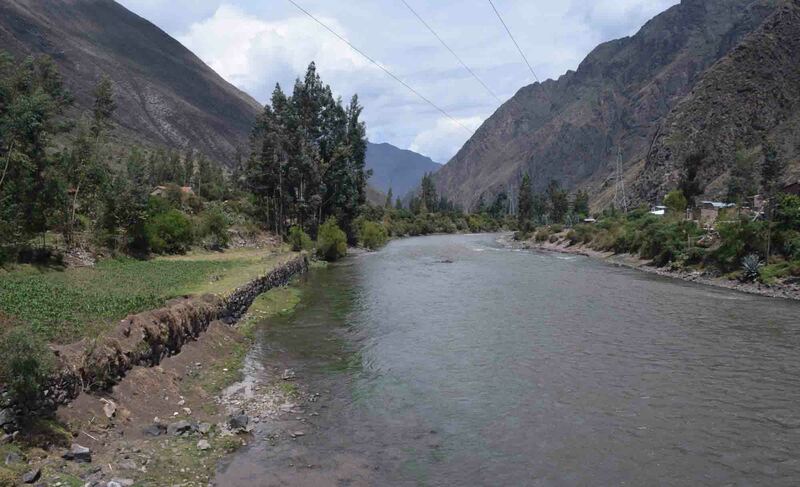 There were a couple of switchbacks down the side of a steep hill, and you follow the Urubamba River for most of the way to Aguas Calientes. As you actually descend to Machu Picchu (which is a few hundred metres lower than Cusco) things get greener. The fact that I had seen very little other than desert and arid land for a couple of weeks made this all the more amazing as it slowly turned into a jungle. Everything denser, greener, more humid. You actually see the changing of the foliage and atmosphere as the trip goes on. Hyrdo Plant on the river. 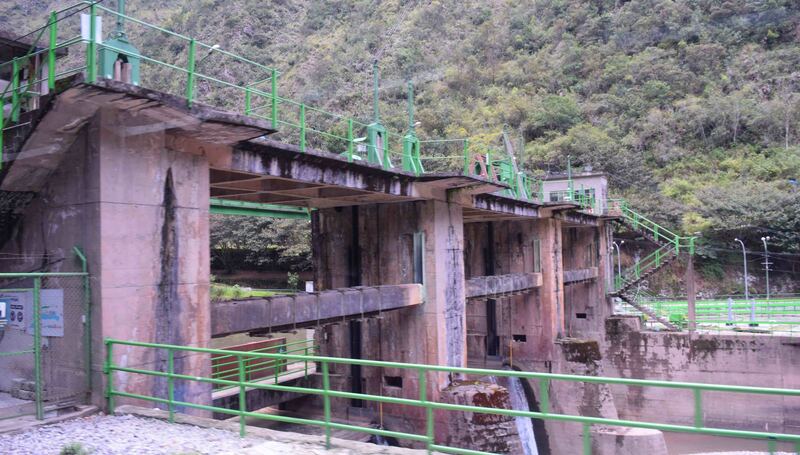 You’re getting close when you pass the dam (used for hydro electricity), and then you’re at Aguas Calientes. Machu Picchu is still a bus ride up the hill (a rather expensive 80 soles return) and getting out of the station is a challenge as you have to go through this thick market before you hit the bridges and see this tourist town carved into the side of a mountain. From there, everything is reasonably close and walkable in the town. Urumbumba River and some smoothly shaped rocks. I enjoyed the trip for what it was. It got me where I wanted to go and it did it in comfort. It’s the best option if you’re not wanting to trek. But at the same time it was a little too comfortable and slick. Despite the location it’s not quite the adventure I was expecting. Here’s a little video I compiled to give you a taste. Have you taken the train? What were your impressions? Thanks for reading, and May the Journey Never End! Lovely scenery. 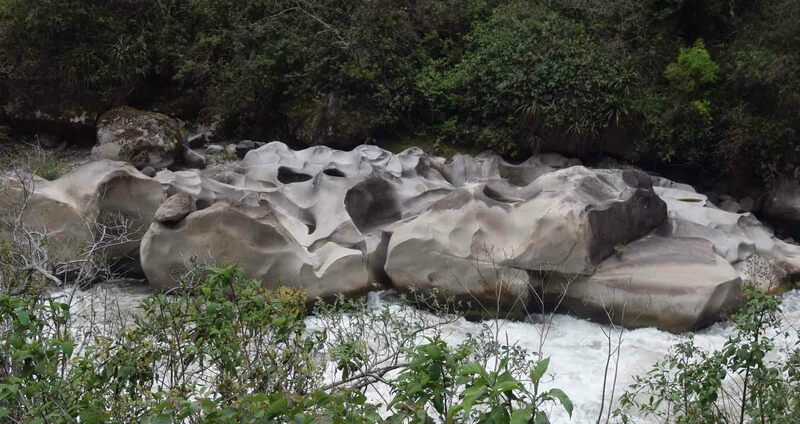 And those river rocks…what interesting shapes! Train rides are so much fun!!! You get to see the hidden beauty of places. Like you said in the post about the beautiful scenery which makes you want to explore the nature. And the photos you shared a wonderful!